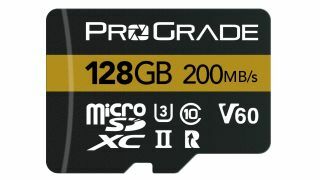 ProGrade Digital has announced a new line of ultra high speed UHS-II microSD cards targeted at the latest generation of 4K action cameras and camera drones. Boasting the highest Class 10 U3 speed class ratings, you can expect maximum read rates of up to 200MB/s and write speeds of 80MB/s. But that's not all. When shooting high resolution, high bit rate video, sustaining a fast write speed can be more important than peak transfer rates. ProGrade recognizes this and has certified these microSD cards with a V60 Video Speed Class, meaning they're guaranteed not to drop below 60MB/s during recording. Each microSD card is supplied with a full-size SD UHS-II adapter to maintain compatibility with DSLR and mirrorless cameras, and as with all ProGrade cards, every card is quality tested and has a unique serial number should you need future technical support. ProGrade Digital microSDXC UHS-II V60 memory cards will be available later in 2018 in 32GB, 64GB and 128GB capacities. Expect to pay $49.99, $74.99 and $114.99 respectively. A fast memory card needs a fast memory card reader, and to this end ProGrade Digital has also expanded its range of Workflow card readers. There's a new dual slot microSD reader which can max out the transfer speeds of the cards in both slots when connected via a USB 3.1 Gen. 2 interface. The second new Workflow card reader is a dual slot SD and CompactFlash reader which can also shift data at up to 10Gb/s. Premium USB Type A-C and C-C cables are included to ensure you get the best possible connection speed. Pricing for each reader is expected to be £79.99. Back in April 2018 ProGrade stunned us with the announcement that they were already working on the next-generation card format, CFexpress. The company's in-house testing boasted incredible transfer speeds of over 1000MB/s, making CFexpress three times faster than CFast and 4x that of a top-end UHS-II SD card. We had hoped the format would be embraced by camera manufacturers very soon, however neither the Nikon Z, Canon EOS R, or the recently announced Panasonic Lumix S1 cameras support CFexpress. But this could change, as CFexpress uses the same external form factor as XQD. Nikon has committed to XQD with the Z7 and Z6, as has Panasonic with the S1 and S1R. ProGrade Digital tells us that it is technically possible to enable a CFexpress card to work in an XQD camera with something as simple as a firmware update. Although it should be noted that exploiting the fastest possible transfer speeds would likely require native CFexpress support at a hardware level, due to XQD's more restrictive data transfer bandwidth. It's not just the speed benefit that could drive adoption of CFexpress by camera manufactures. XQD is a proprietary card format controlled largely by Sony, and its implementation is subject to licensing fees and design restrictions. CFexpress on the other hand is an open-source standard, making it potentially cheaper to implement and for photographers to buy into. More speed for less money: it seems you can have your cake and eat it, albeit not quite yet.